The lovely folks at Here Now have an open call for pitches for a brilliant idea to help shift the narrative of climate and clean energy. The deadline is Fri Aug 14 so get your skates on! And if you really can't make the date but have an ace idea, it might be worth pinging them anyway. What are we looking for? *Seeking a creative pitch for captivating and unique content that will inspire the public to engage with climate and clean energy in new, human ways. In a time when much of the narrative sends the message that "we're all doomed," this project steers the climate conversation in a more promising direction to focus on the transformational vision of a better world for all. Incorporating stories of people, compelling characters and the greater future we are all creating together, the audience should feel awe-inspired after interacting with the content you create. What is the purpose of the project?To engage new audiences and the mainstream around the vision of 100% clean energy, decarbonization, and a better future for all. (It's within reach!) Not only that, but also to create something widely shareable which will start conversations on social media around the world. Together, we'll learn what's working and tell even more great stories. In which format should the final project be?It's up to you! We are open to the type of work you do best. Whether it be a video, music, imagery, animation, we want to hear your ideas! If you're already working on a project that could fit within the framework of this project or you have an idea for a piece, this is the perfect opportunity to bring it to life. How do I submit an RFP?Please read the attached creative brief for all the information you need to develop a 3-page RFP. Submit an RFP with estimated cost to [email protected] by Friday, August 14. What do I do next?Forward this email to anyone you know who may be interested in submitting an RFP for this project. If you are planning to submit, please email the address listed above with your contact information and confirmation ASAP. 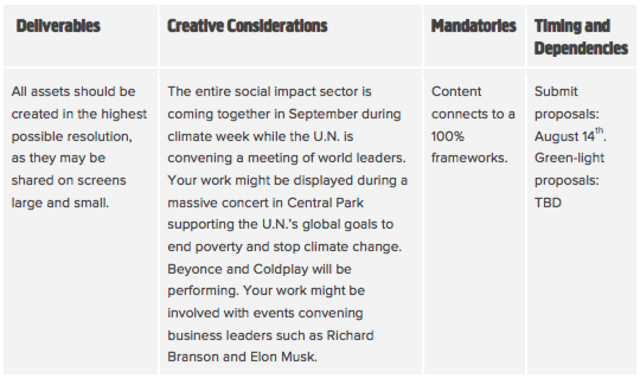 If you'd like your work to be featured for tens of thousands in NYC when the entire social good sector comes together, aim to have the final project ready on September 11. Otherwise, tell us what your desired deadline is. Feel free to reach out if you have any questions. Your stories can change the world before climate change has the chance to destroy it. Pitch your ideas, and we’ll help you bring them tolife. But it’s also not all bad. To win, we need to inspire the world. We need to break away from cliched narratives of heroes, villains, and victims. Amazing things are happening across the globe to revolutionize the way we power our world, and bringing transformational change to all life on Earth. There are great stories to be told, characters to engage with, through humor, drama and art. In a world where newspaper circulation is tanking (especially among young people – almost a third of UK 18-24 years olds have not read a newspaper in the last year), branded content spending is hitting record levels and most millennials are getting their news from Facebook, it’s clear that if we want to be reaching millions with vital information about climate change we need to be doing it through shareable content optimized for social media. • 350’s Climate Name Change – 3.1m viewsUnfortunately, there are many more unsuccessful examples. The above pieces are all quite different from one another, and evidence that we don’t know yet what will work. But we do know that there is room to create breakthrough stories that will inspire the public to engage with climate and clean energy in new ways. Create captivating stories and content to engage new audiences around the vision of 100% clean energy for all. Proposed works can be in any medium: Film, Animation, Music, Art, Design, Animation, Data Visualization for example. Page 1: Summary of your concept. Include the audience you plan on targeting, content distribution ideas (where does it live and how will it get to your audience? ), tone and voice, and format. Explain how this piece will get people to see climate change and a clean energy world in a new way. Page 2: Visual reference. Include images that help us understand the visual tone and aesthetic of the piece. Page 3: Rough budget outline. What will you need to create the work? Imagine a world powered 100% by clean, safe, renewable energy, for 100% of the people. An energy system accessible to all that harnesses the power of nature and leaves behind the destructive pollution of fossil fuels, forever. In this world, we use the wind, sun and sea, the earth’s natural heat, its rivers and its biomass to power the things we love: our journeys to new places, seeing the latest blockbuster, our iPhones and Netflix binges, our visiting our loved ones, watching our team win. We are free not just of the toxic pollution from fossil fuels, their destructive impact on our climate, our communities, our health, and their threat to our kids’ futures, but we’re also free of their toxic force in our politics, on our democracies, on our rights, and of the millions of dollars of our tax money that goes to subsidising them. In this new world energy is generated not just by giant companies, but often in communities, by communities, for communities. It sounds like utopia, but it isn’t. It’s the world we know and love, with its challenges, its frailties, its complexities, its betrayals. It isn’t perfect, but it’s better. From farmers earning a second income as energy producers in Germany and Australia to schools developing electric school buses to help reduce kids’ exposure to air pollution, communities are already coming together to change the world and reaping the benefits. We want to find the entrepreneur creating a new energy grid along the coastal plains in Africa, the grandpa building mini wind turbines in his garden shed, the love story born in a moment of extreme weather. Stories of awe, wonder, power and beauty are going to show us the light of a better world. Climate change is far from simply an environmental issue – at its heart are matters of social justice, equality, and many of the other issues we all care deeply about. The transition to clean energy is all about empowering people to create the world that this generation wants to live in – people power, collective action, community, decentralization, reclaiming power. The transition can be just, open source and accessible to all: it means shared benefits and shared progress, power shifting from the hands of the few to the many. We want to capture the vision of a shared future with people at the core, and explore the lives of real people affected by and interested in climate change and its intersecting issues in an authentic way. Families, communities, Indigenous populations, street kids, activists and bored teenagers all have a role to play. We are looking to create content for new audiences around the globe.We need to reach people that are not already activists and intellectuals. Engaging new audiences and discovering new entry points for people to be moved towards action is mission critical. What are the current and desired audience perceptions? Persuasion: We want people to feel that the transformational vision of 100% clean energy, decarbonization and a better life is possible and within reach. Action: We want to inspire people to take action and feel empowered with possibility.Share-worthy: We want our content to be massively shared and viewed as a conversation starter across social media. What does success look like if we’ve done this project well and how will we measure it?Major media outlets cover the piece, Oil companies are scrambling to reposition themselves, Republican presidential candidates are running for cover, record setting numbers of people are moving towards renewable energy, and we are on a path to 100% clean energy for everyone on the planet. And, we’ll learn together what works and what doesn’t to engage people in this conversation - and share back those learnings with this growing community of storytellers. How will we choose which proposal to bring to life? Those that feel they can hit the RFP submission due date: Friday, August 14th with their proposals will be priority. Proposals that need extended timelines are also welcome, but may not be commissioned until an undetermined future date.